Couples and families argue over their respective perspectives, and want the other members to see their argument from their viewpoint. Individuals come in confused or sad about not having anyone understand how they feel, or what their experiences have been. Kids have great difficulty understanding another’s point of view, but do become more skilled the older they get. There’s a ridiculously old Eastern proverb about blind men meeting an elephant that I love which (in very short summary) describes a group of blind men encountering an elephant for the first time. 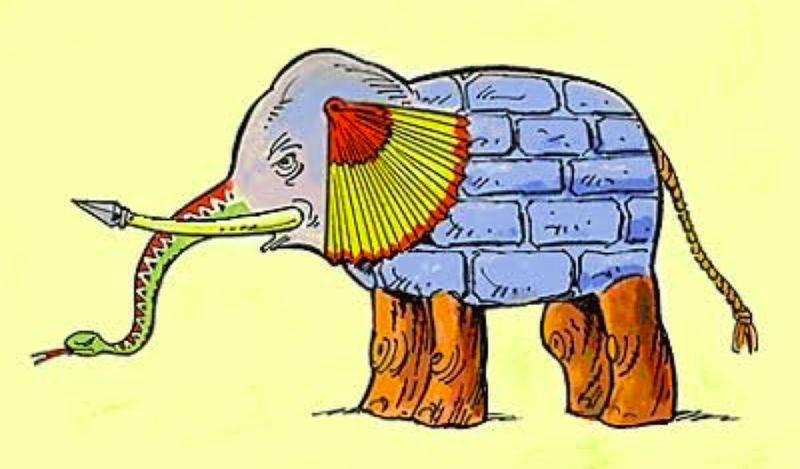 Each man touches a specific part of the elephant, and based on their physical experience, makes a judgment call on what they think this creature is. (i.e., they think the tusk is a spear, or the leg is a tree). I’m not sure how much it can be stressed how difficult it is to see something from another person’s perspective. It requires movement on our part, to actually GO to where they are (if possible). Even if we were to move to where they are, we probably won’t use exactly the same language, or use different comparative analogies to describe something. The thing is, we can’t actually see another person’s point of view perfectly …since we aren’t them. Thus, good perspective-taking requires a certain level of trust from the other. It means if I want to honor someone else’s perspective, I have to honor and value them as a person and trust that their experiences have led them to a place to have a perspective of their own, and their perspective is a valuable part of them. Perspectives aren’t the whole truth. I mean, I wish they were. But maybe we don’t actually take another person’s perspective, but we honor it as it simply as it exists…so that we can engage together on our journey toward understanding.